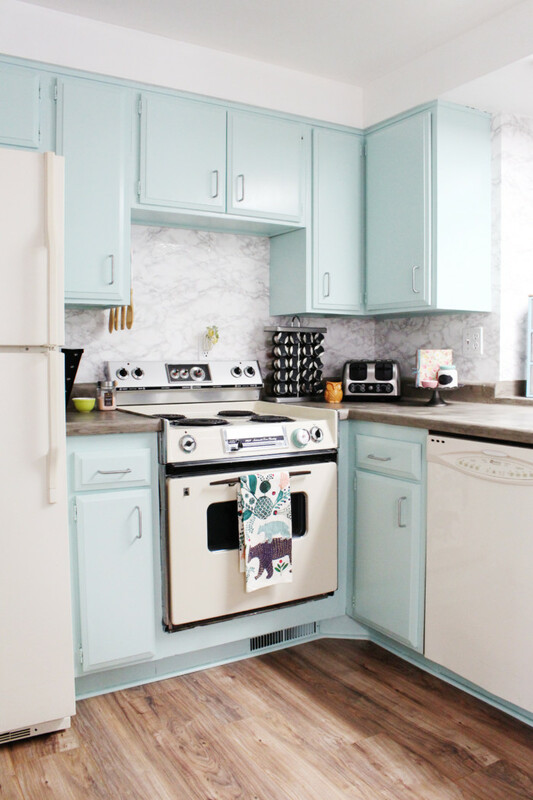 Grab these colorful vintage fridge printables (with or without flair!) 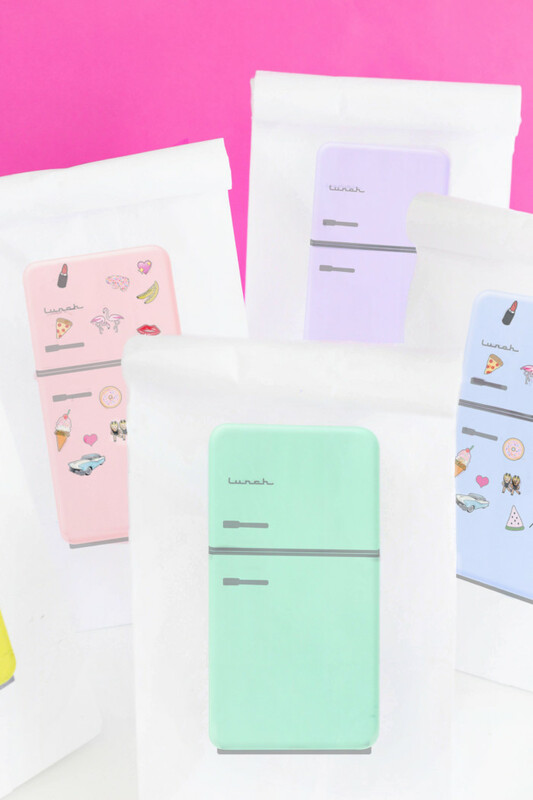 and print out your own custom lunchbags. 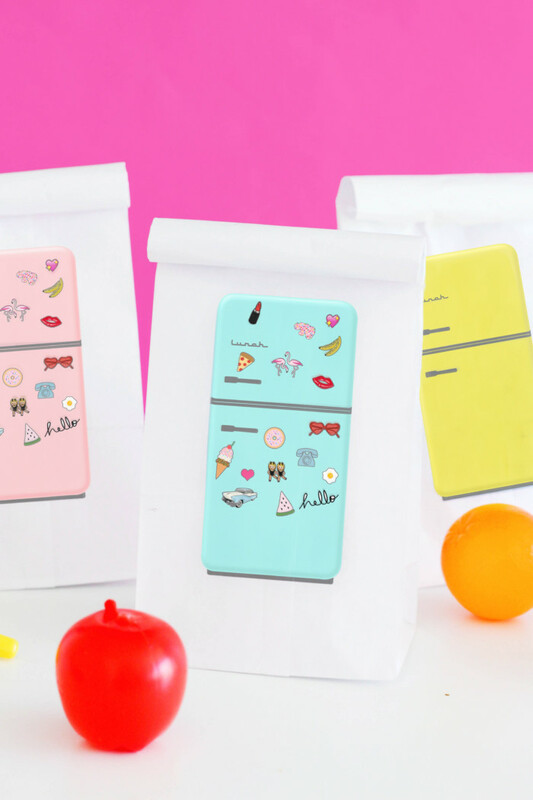 Perfect for customizing work or school bag lunches. We have never done a back-to-school post before! Isn’t that crazy? I love all things apple and chalkboard so I kinda can’t believe we haven’t jumped on that train yet. Its probably because we don’t have school-age children to make us think about terrible things like the end of summer :/ Even though I have been going to school, it feels different when you’re an adult in college. So I don’t know! I guess that’s going to be my excuse? Anyway, the only reason I even thought about it this year is because I’m trying to pack lunches for my husband more frequently. It’s never worked all that well for us before (he gets hungry earlier if food is just there and eats it then still has to go out for food later). Plus, I know leaving to buy lunch is the only time he leaves work at all so I like that he at least does that. But anyway, we thought it would be a good idea to try it again! And I got thinking, “I have nothing good to put his lunches in.” Which then made me think about custom lunch bags, as one does. I then realized that I could probably print up some of my own! I am all about the printables! So I set out to make some graphics, especially once I realized that it was back to school time so it would be well-timed to share them with you! Admittedly, the resulting graphics ended up being FAR more colorful and girly than he will like and I doubt I’ll even use them for him. But I just LOVE them! 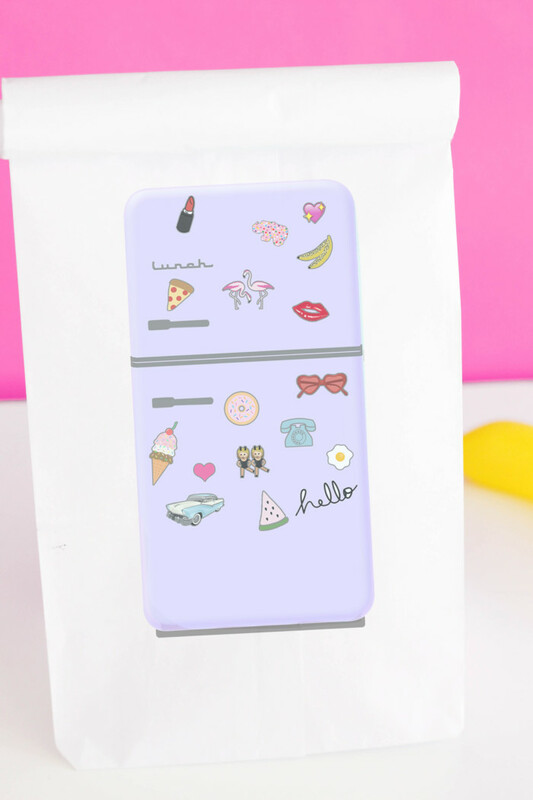 There are few things cuter than a Big Chill fridge and so I decided to make some graphics channeling those appliances. This post is in no way sponsored or affiliated with them. 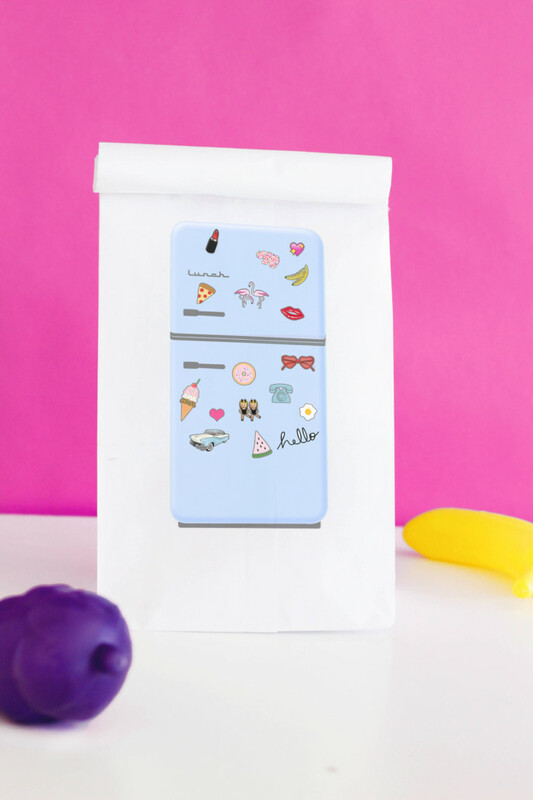 I just thought a fridge made sense to put on a lunchbag and so I had to choose the cutest kind, obviously. 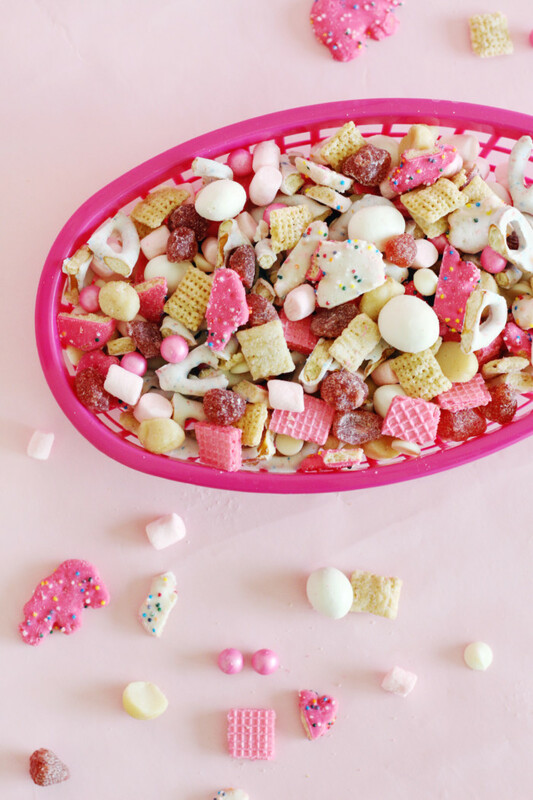 Over-the-top sweet and pink trail mix recipe featuring frosted animal cookies, chocolate pieces, birthday cake pretzels, candy-like dried strawberries and more! 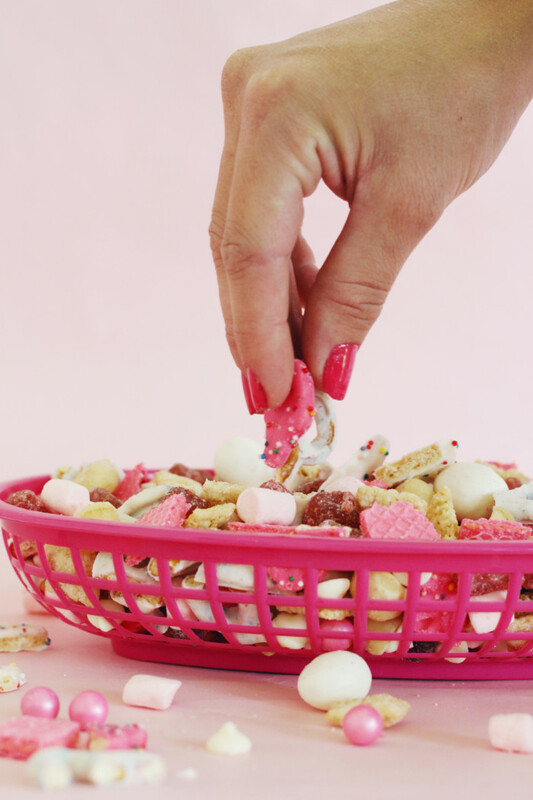 Even though I don’t feel like I have a great excuse to work on animal cookie projects anymore (because I no longer need them for my daughter’s birthday party) I still think about the cute little sprinkled confections often. They just hold a dear place in my heart. So when I heard about nuts.com contest for National Trail Mix Day, my mind immediately went to my favorite cookie, my mind immediately when to my favorite cookie. 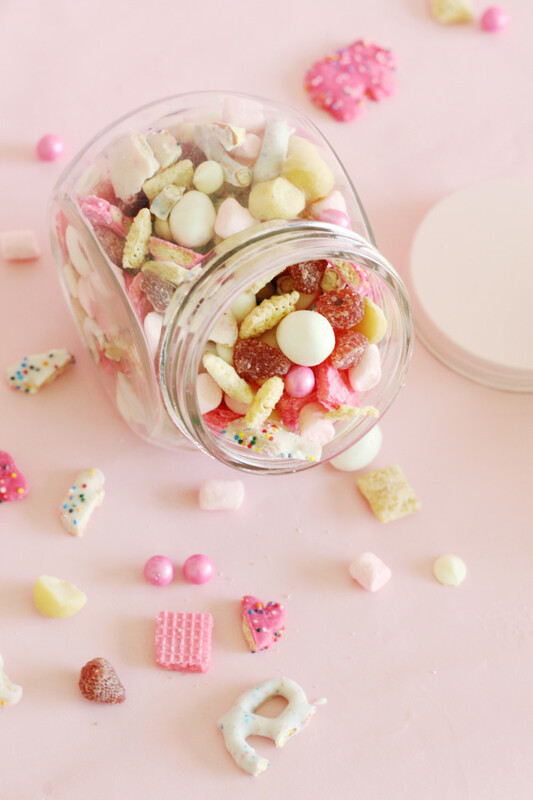 Even though trail mix is usually thought of as a healthy, outdoor-activity-appropriate snack, I just couldn’t resist making my mix all sweet and pink! I like to make things that I know Stella will eat rather than things that are just for me. While she likes nuts and dried fruits so I know a more traditional mix would’ve been okay, I guess I was just feeling really nice and wanted her to have a snack she would absolutely love! And, since pink is her favorite color (it kills me how this just happens. Like, she knows nothing about pink being girly. She isn’t surrounded by girly friends or cousins or anything! And yet, pink was the first color she learned, still the only one she always knows and gets consistently right, and always the color she chooses.) I knew she would love this snack mix. Psh, with cookies, candy, marshmallows and chocolate covered pretzels, who wouldn’t love it?! 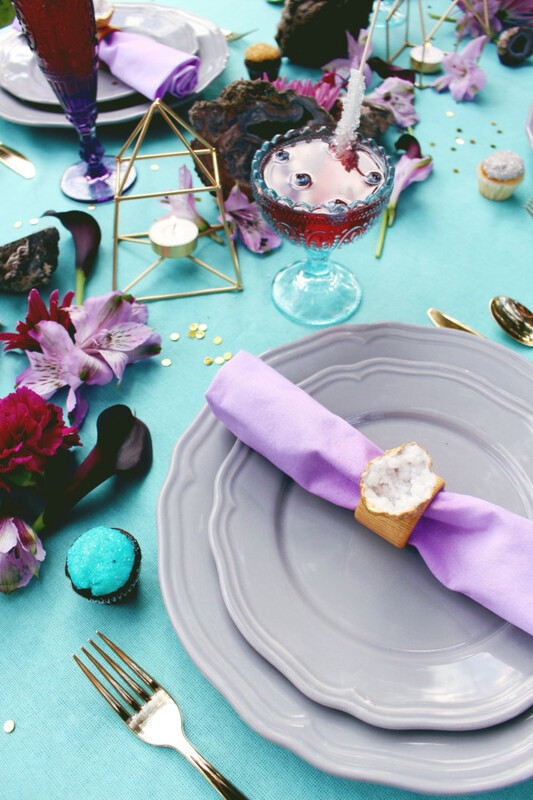 Quickly jazz up some simple napkin rings with gorgeous gemstones like geodes, crystal or amethyst and a little gold paint! Last year, I found these napkin rings at a restaurant supply store by my house for 25 cents each! I just knew I’d have a use for them someday and I’m actually surprised it took me so long to come up with one. I guess I just don’t use napkin rings all that often! But I finally found the perfect opportunity, which there is a little sneak peak of here! I will share the whole party at the beginning of September. Until then I’ll share a few DIYs that I used in that final event. Starting with this easy and pretty gemstone napkin ring upgrade! 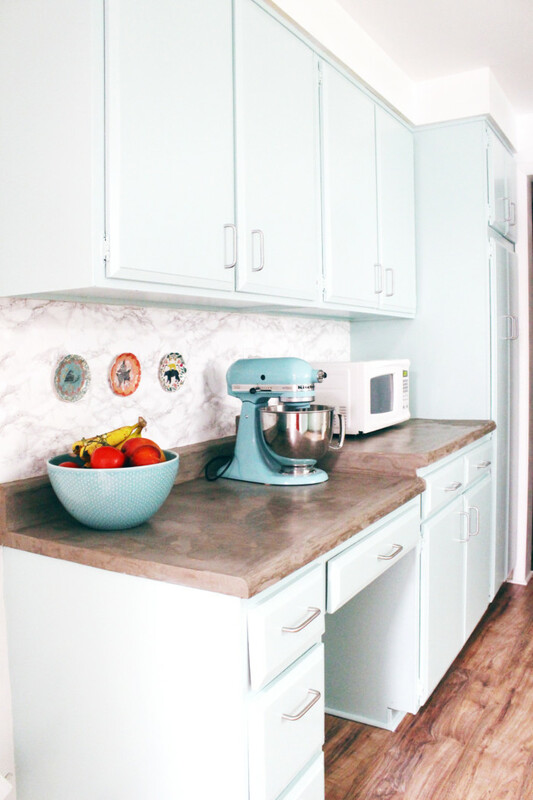 I’ve already showed quite a bit of my kitchen (here, here and here) but I wanted to show you the whole kitchen remodel and all of the DIY details in one post as well as talk a little about my countertops! I am so excited to have this space done. And I have to admit that I feel really proud of it! 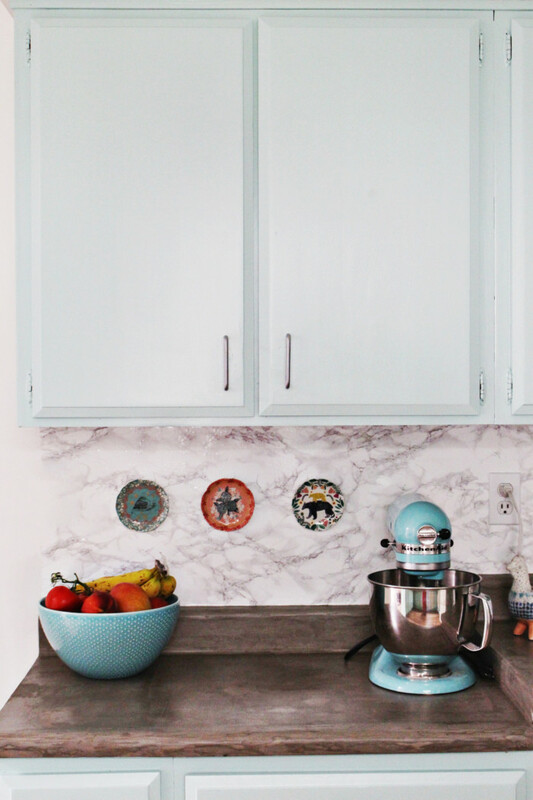 It’s not perfect by any means and it’s not my dream kitchen. But it is literally 1000% better than it was. 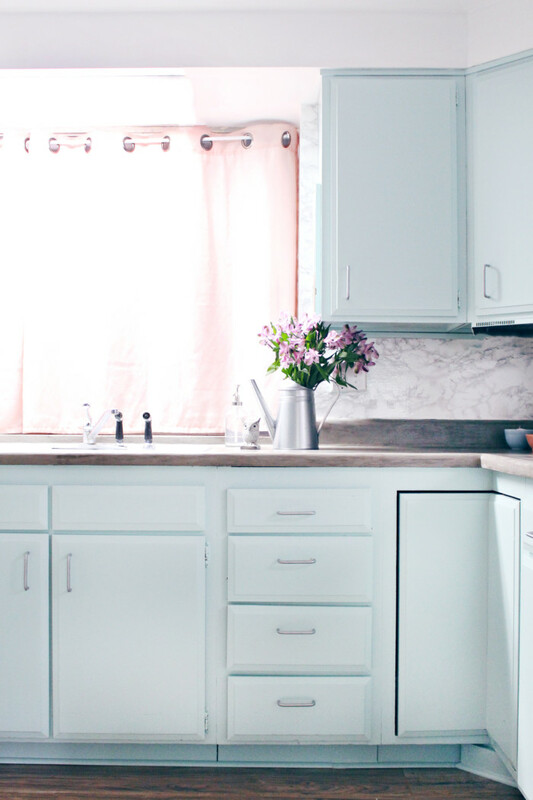 This kitchen was the last place of my house that I really felt like I needed to complete before we have this next baby. I’d love to get the nursery and craft room done as well, and plan to at least start both next month, but I don’t know that they will be completed before October. Really none of that matters though! Mainly because neither of those rooms are places you absolutely have to have the baby in. They’re out of the way, not a required passageway to the rest of the house like the kitchen is. This kitchen sits right in the middle of our home. Which makes it not only hard to get beautiful, natural lighting (the blogger in me cares a lot about this haha) but also a required place of passage to get basically anywhere else. I don’t mind this now that the space is bright, colorful and new. 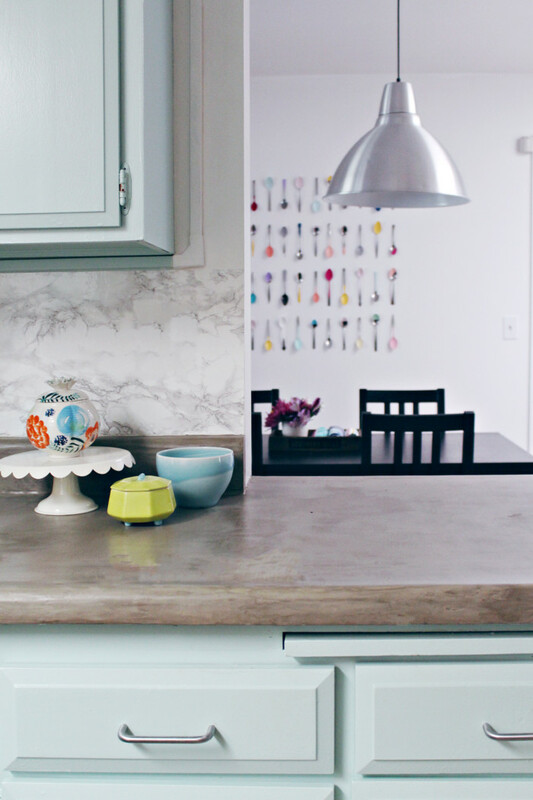 But, when we moved in, this kitchen was a different story. There was a lot I didn’t like about it. Ugly light fixtures, a weird window, dark brown cabinets and old hardware. But mainly, all you really need to know is that the kitchen was carpeted. The whole time I was ripping it out, I just kept thinking “what was wrong with everyone in the 70’s? !” I know it was kind of a thing to do back then and, for the life of me, I just cannot imagine whyyy. The one space that you’re basically guaranteed to spill in every time you use it and lots of people thought it was a great idea to make it impossible to fully clean up by putting a super absorbent surface there…so interesting. And yes, the carpet in this kitchen was from the 70’s. It was 45 years old. It horrified me and it especially horrified me to imagine my baby crawling around on it…shudder. 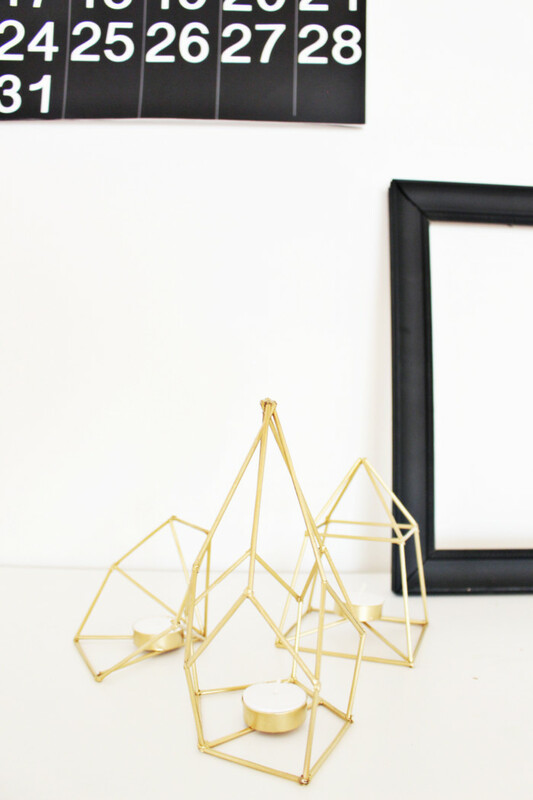 If you love geometric vases and candle holders, then you’ll love this DIY that only requires cheap wood skewers, glue and paint! 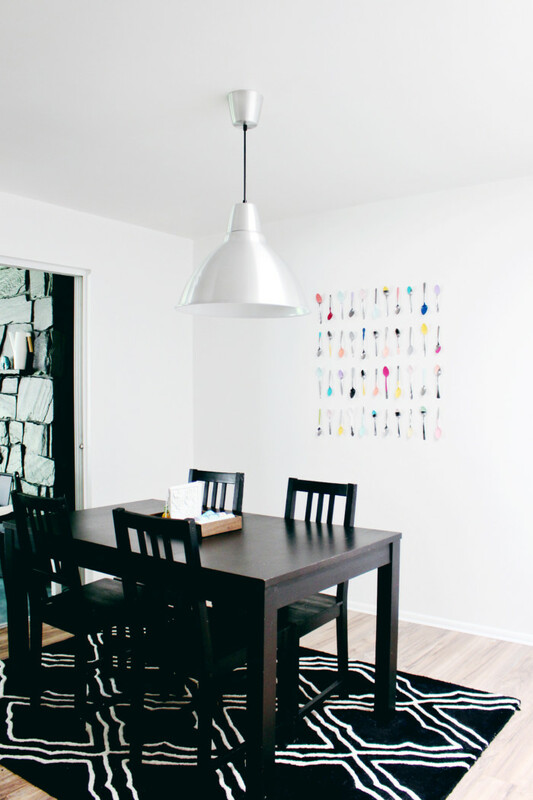 For less than $2, get unique decor you can use over and over. 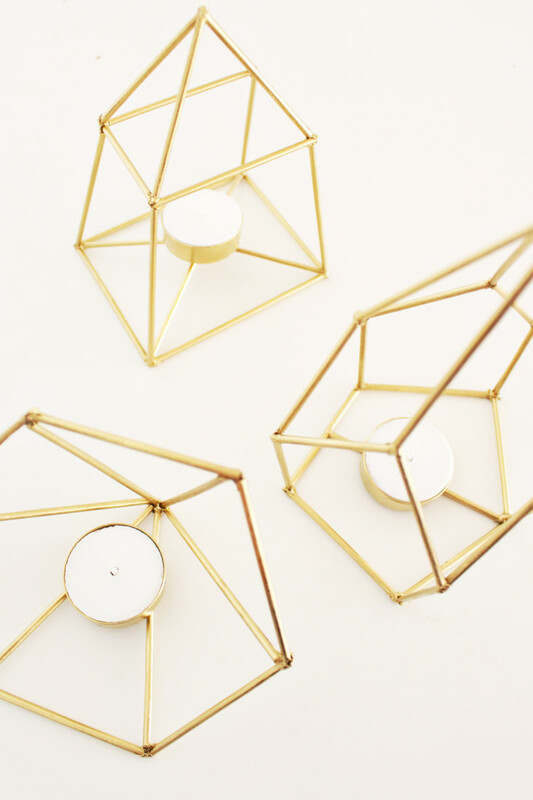 A few weeks ago, I fell in love with these geometric cake stands. What a fun DIY! 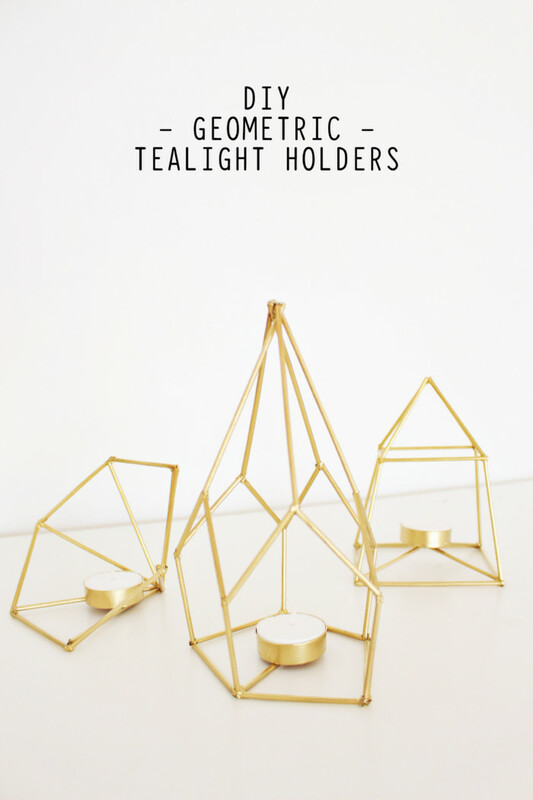 I’ve been planning a dinner party where these gem-like shapes will fit in perfectly so I knew I had to incorporate such a project into it. I ended up not having enough time to order the type of vases she used so I knew the cake stands were out. But I still wanted to involve the geometric shapes somehow. I came up with these DIY candle holders. They’re made out of wood so they’re not super sturdy, which is why I didn’t feel like they could be used as the base for a cake stand. But I plan on setting them out on the dinner table amongst the flowers and other decor. So I thought filling them with tiny tea lights would be perfect. I absolutely love candles on the dinner table, the ambiance the flicker provides. These will be perfect for decor so I can get over the fact that I don’t have those amazing cake stands.